OK, stick the kids in front of the TV, send your spouse out with friends and sit down for a little while to read this amazing article by Toronto Star Reporters Sara Mojtehedzadeh and Brendan Kennedy. 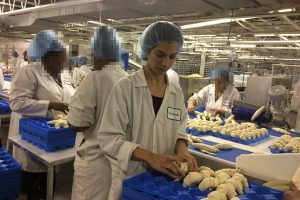 Mojtehedzadeh went to work undercover as a temporary employee at Fiera Foods, an industrial bakery in Toronto where a worker had died, to learn first-hand about working conditions at he factory. Much has been written lately about the fragmentation (or “fissuring“) of the workplace, where more and more workers are officially employed by temporary agencies, not by the companies they actually work at. Data in the US and other countries has found these jobs are growing rapidly, and expanding into dangerous occupations. And that temp workers suffer higher numbers of workplace injuries and deaths than permanent workers. OSHA, during the Obama administration, launched a campaign on Protecting Temporary Workers and issued Recommended Practices and numerous alerts after becoming aware of numerous preventable deaths and disabling injuries of temporary workers, some on their first day of the job. One temporary worker, Day Davis, was crushed to death at a Bacardi Bottling factory in Jacksonville, Florida in 2013, 90 minutes into his first day on the job. He had been told to clean under a pallatizer, and was crushed to death when someone turned it on when he was underneath. He had received no safety training. His story was highlighted in a ProPublica article and a movie, A Day’s Work. I’ll take a few minutes to summarize some of the main points, but please read the article, watch the videos and listen to some of the phone conversations that Mojtehedzadeh had with the company and its representatives. 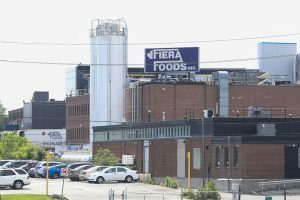 “Fiera said health and safety is a ‘core principle,’ the company told the Star,” and the initial company email says that worker safety is the bakery’s “highest concern.” But it wasn’t. They promised safety training and regular safety meeting, in addition to “hands-on instruction for workers, weekly meetings with supervisors about health and safety, bulletin boards with information about safety policies.” In reality, she only received five minutes of training in a factory packed with industrial equipment. Responding to a series of follow-up questions from the Star, David Gelbloom — who in addition to his role as administrator of Upper Crust, is Fiera’s general counsel and HR manager — says my supervisor provided a health and safety orientation and told me the location of the fire exits. In fact, I was trained by a woman. While temp agencies are traditionally associated with casual office work, statistics from the WSIB show the majority of temps are now being placed in other sectors — including non-clerical, construction, restaurant and driving jobs. The Star also asked the WSIB (Workplace Safety and Insurance Board) for injury data filed by non-clerical temp agencies — those operating in sectors like manufacturing, warehousing, and health care — and comparable workplaces. The statistics showed non-clerical temps were more than twice as likely to get hurt on the job in 2016 as non-temp counterparts. In fact, the injury rate for temps in non-clerical workplaces has consistently been close to double that of other comparable sectors for the past 10 years. However, since 2010, temp agency workers spent fewer days off work as a result of their injuries, according to the compensation board’s figures. What if you’re injured on the job? Even when they get hurt, many temp workers don’t file compensation claims because they are afraid of losing their job. “(Temp agency workers) can easily be told, following an injury, that ‘you’re not covered by workers’ comp’ or ‘we have no more work for you,’” says Ellen MacEachen, a professor at the University of Waterloo and affiliate of the Toronto-based Institute for Work & Health. Claims suppression was identified as an issue across all sectors in a 2013 study for the WSIB. It found that of 100 enforcement files analyzed, 48 contained indications of employers directly trying to block or dissuade workers from filing an injury claim. MacEachen says the problem is particularly acute for temps, who can be let go for no reason. The fact is that despite “safety being a core value,” Fiera is a dangerous place to work. In addition to Diaby, two other temp agency workers have died at Fiera or its affiliated companies. In 1999, a 17-year old temp named Ivan Golyashov was killed at Fiera’s Norelco Dr. plant when a dough mixer was activated while he was inside cleaning it. In 2011, 69-year-old Aydin Kazimov was crushed by a transport truck outside Marmora Freezing Corp. Fiera Foods and Marmora were convicted in each case under the Occupational Health and Safety Act and fined $150,000 on each occasion. In 2013, Fiera received a $3.2 million federal business loan. The following year, Fiera was awarded a $1.5 million grant from the provincial Ministry of Agriculture, Food and Rural Affairs to expand capacity. At the time, the company was lauded by Premier Kathleen Wynne for providing “good jobs” to Torontonians. OK, I’m stopping here. Enough doing your work for you. Go read the article yourself. There’s plenty more there about lack of sick leave, sub-poverty level wages, having to travel a half hour to pick up their pay checks, etc., etc. This story is from Canada, but we’re seeing the same thing here in the good old US of A. This is a manifestation of the “Fissured Workplace,” a phenomenon that former Obama Wage and Hour Administrator David Weil has written extensively about, where companies at the top contract out major downstream parts of the business. (For more information, get a copy of The Fissured Workplace: Why Work Became So Bad for So Many and What Can Be Done to Improve It.) For some temp agencies, like the one that employed Mojtehedzadeh, their “office” may just be a post-box and their only “asset” may be a cell phone. OSHA under the Obama administration attempted to make clear to temp agencies and host companies that, depending on the individual circumstances of a case, they may both have responsibility for ensuring the safety and health of their employees. And a host company (like Fiera, for example) cannot just shove all of the responsibility onto the staffing agency. OSHA began enforcement actions against both the host company and the temp agency. For example, after the death of Regina Allen Elsea, OSHA issued citations against staffing agencies Alliance Total Solutions and Joynus Staffing Corp, as well as against Ajin USA, which supplied auto parts for Kia and Hyundai. Also note that OSHA issued press releases in these cases to ensure that temp agencies and host employers across the country got the message that both are responsible for the safety of their workers. Republicans in charge in Congress and the White House have been fighting the concept of joint employment. Although mostly focused on Obama era actions by the National Labor Relations Board and the Wage and Hour Division of the Department of Labor, it remains to be seen whether Trump’s OSHA willgo after temp agencies and host employers who endanger workers as aggressively as the Obama administration did. Next Post Next post: OSHA Alliance: Protecting Workers or Protecting the Chemical Industry?